Secondhand smoke, also called environmental tobacco smoke, is a combination of smoke from the burning end of a cigarette and the smoke exhaled by smokers. Exposure to secondhand smoke occurs when a tobacco product is smoked in an enclosed area or around another individual. Secondhand smoke contains more than 7,000 chemicals, and at least 70 of them are known to cause cancer. In adults who have never smoked, secondhand smoke can cause heart disease, lung cancer, and stroke. Secondhand smoke caused an estimated 34,000 heart disease deaths and 7,300 lung cancer deaths each year from 2005 to 2009. Virtually everyone faces some risk of harm from secondhand smoke. In a CDC study, 99% of nonsmokers were found to have measurable amounts of cotinine (a chemical the body metabolizes from nicotine) in their bodies. People with chronic conditions are more likely than healthy people to suffer when exposed to secondhand smoke. Secondhand smoke can aggravate allergies, asthma symptoms, and cause other respiratory and lung conditions. People spend the majority of their time at home and work. The Nevada Clean Indoor Air Act has reduced the exposure many Nevadans are subject to in the workplace, but there are still many people working in casinos and other exempt locations that suffer daily exposure to secondhand smoke. For any environment, the level of harm from exposure depends on total time spent in the environment and the amount of smoke in that air space. Smoke-free workplace laws and voluntary smoke-free home pledges help to reduce the health risks of secondhand smoke. What are the health risks for children exposed to secondhand smoke? Secondhand smoke is especially dangerous to children because their lungs are still developing. Studies show that older children whose parents smoke get sick more often and have poorer lung function than children who are not exposed. How can you protect the health of your children? Make your home and car smoke-free. If you are a smoker, never light up inside your home or car, even if the windows are down. Don’t permit others to smoke in your home or car. Don’t smoke inside, even when children are not present. 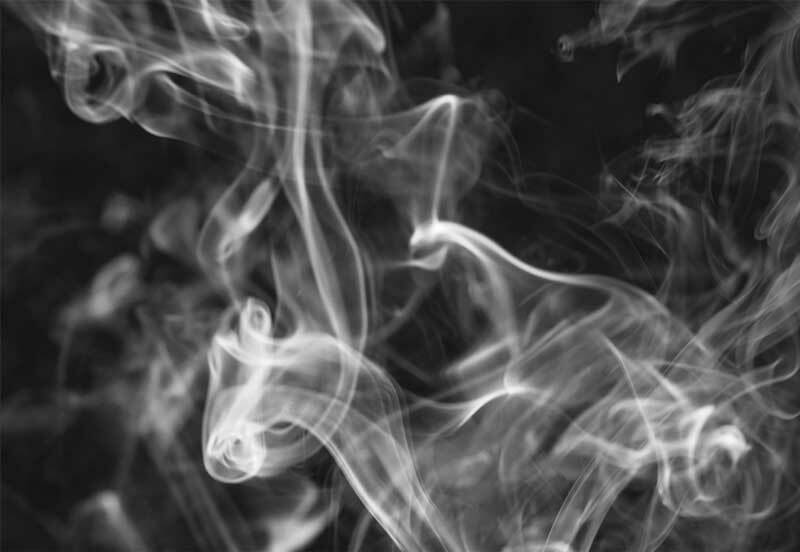 Studies reveal that smoke can linger in an enclosed area for up to seven days after a person has smoked. Avoid places that still allow smoking indoors. What can child care centers do to protect the health of children in their care? If you are a child care provider, learning to recognize, reduce, or eliminate potential asthma triggers in your center could make a huge difference in the life of a child with asthma and other respiratory conditions. Download the Asthma & Common Triggers PDF (103 KB) fact sheet to learn more. Do not allow people to smoke or use any tobacco products in your home or center. Adopt a formal written tobacco-free policy for your home or center. Make copies available to everyone. View a sample policy. To learn more about the requirements of the Nevada Clean Indoor Air Act for Child Care Facilities view our Guide. Download a smoke-free childcare facility sign to post in your childcare center or call (702) 759-1270 to request FREE copies of any sign shown below. 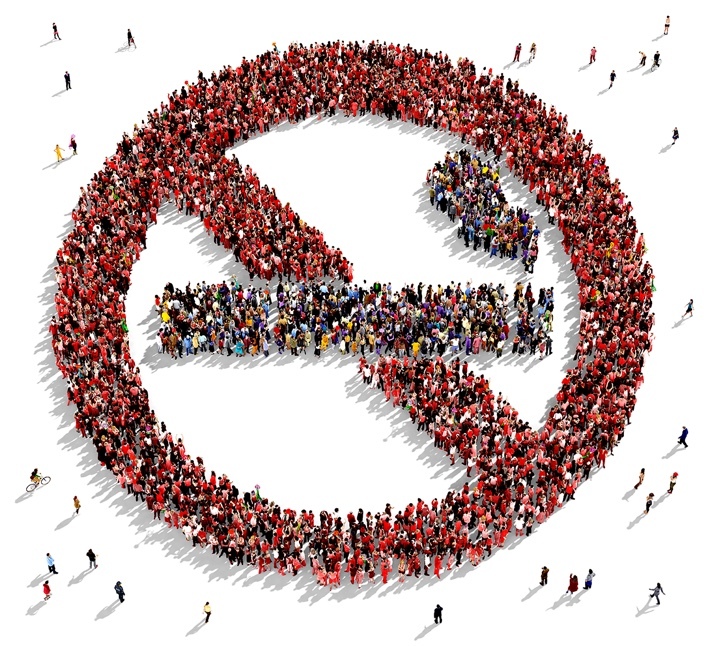 The Nevada Clean Indoor Air Act prohibits the smoking of tobacco products in most public spaces and indoor places of employment. The Southern Nevada Health District provides guides for businesses and the general public to help them better understand the law and how it applies to them. Visit Nevada Clean Indoor Air Act Resources for more information. To report violations of the Nevada Clean Indoor Air Act, complete the NCIAA Complaint Form or call (702) 759-1990. For more information on the smoking and tobacco laws in Nevada, refer to Nevada Revised Statute (NRS) 202.2483, and the Nevada Clean Indoor Air Act. Who enforces the smoking laws in Nevada? The State of Nevada has laws against tobacco use to protect human health and safety. The State, District, or County Boards of Health are responsible for enforcing laws regarding public smoking in areas or buildings where it is limited. The State Attorney General or contracted agencies enforce laws regarding access by minors to tobacco products and enforce laws regarding inspections of tobacco retailers for compliance with the ban on access of minors to tobacco products. Can Clark County, the City of Las Vegas, or the health district ban smoking in public places? With the passage of the Nevada Clean Indoor Air Act, the Nevada state law was strengthened to ban smoking in most public places. The passage of the Act also allows local (city/county/town) governments in Nevada to enact and approve tobacco ordinances or regulations in their jurisdictions even stricter than the new state law. With the passage of the Nevada Clean Indoor Air Act, where is smoking now banned in Nevada? How does the law allow for smoking in the above mentioned areas? The person in control of any of the above facilities must post signs banning smoking in their establishment and remove all smoking paraphernalia (e.g., ashtrays). What does the law say about the slot machine areas of grocery and convenience stores? Nevada law now bans smoking in all areas of grocery and convenience stores, including the gaming areas in these businesses. What does the law say about casinos and smoking? The Nevada Clean Indoor Air Act does not apply to gaming areas of casinos, but does apply in all other areas. Smoking is still allowed on the gaming floor of casinos, where children are prevented from loitering by law. However, the operator of these facilities can designate separate rooms or areas on or within the gaming floor as non-smoking. For example, many casinos now voluntarily offer smoke-free poker rooms and sportsbooks. On the other hand, smoking is not allowed in other areas of casinos, especially those where children are allowed, including restaurants, bars that allow minors, convention facilities (except those used for tobacco-related trade shows, that meet certain conditions), hallways, bathrooms, elevators, employee break rooms, movie theaters, video arcades, etc. All indoor areas of restaurants must be smoke-free. Smoking is still allowed in outdoor areas of restaurants. Restaurants that are contained within gaming establishments or casinos are also required to ban smoking. Bars are required to be smoke-free if they allow minors under the age of 21 to enter the premises. Age-restricted bars (those that only allow 21 and over) are permitted to have smoking indoors, per the 2011 Legislature. What are the laws concerning minors and tobacco? Nevada law makes it unlawful for any person to sell, distribute, or offer to sell cigarettes, cigarette paper, and tobacco of any description or products made from tobacco to any child under the age of 18. A separate Nevada law limits cigarette vending machines to areas where minors are not allowed and does not allow vending machines to mix tobacco products with any non-tobacco products. Who enforces the laws regarding the sale of tobacco products to minors? The Attorney General’s office enforces these laws. They are authorized to conduct inspections (stings) of local tobacco retail stores for sales to minors. A federal law, known as the Synar Amendment, requires the state to take reasonable steps to enforce its own law that prohibits the sale of tobacco products to minors. The Attorney General’s office funds their inspection program using money from the tobacco settlement. The Nevada Clean Indoor Air Act does not restrict smoking outside building entrances. However, business owners have the right to implement voluntary “no smoking” policies of their own, specifying a set distance away from their establishment where smoking can occur. Such policies minimize the amount of tobacco smoke entering a building through doors, windows, ventilation systems, or any other means, and allow customers to enter your business without exposure to secondhand smoke. 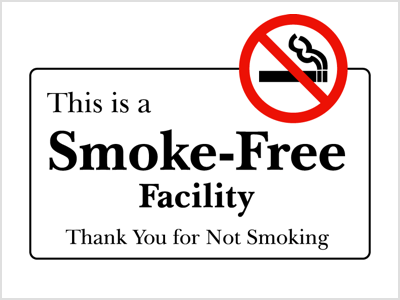 Download these free “No Smoking” signs to display at your own business.